Up in the Lake District, you are forced to ‘ramble’ everywhere. Ok so maybe not actually forced but there is something so magical about this region of the British Isles that it makes you start looking at hiking poles as a serious purchase. Anyway, rambling creates hunger and thirst. So the best solution for this is inevitably a pub. We went to the Drunken Duck near Ambleside after my sister recommended it to us. 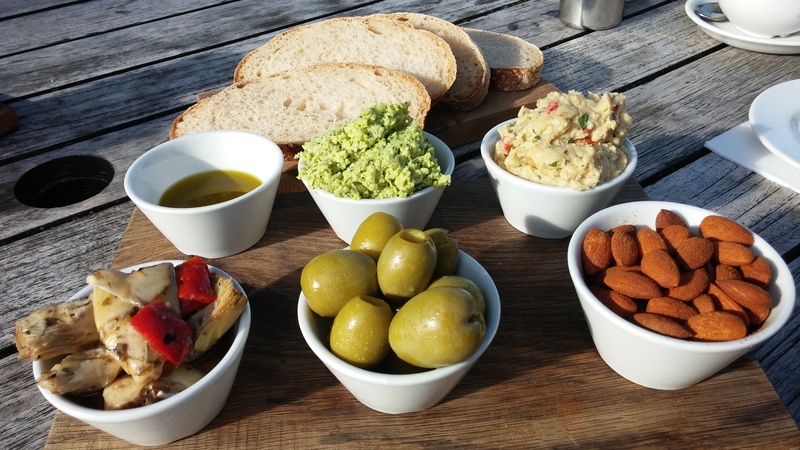 We sat in the sunshine with the mezze – an enormous platter of delicious treats (just look at the size of those olives!) washed down with some wonderful real ale (many of which are suitable for vegans) which is brewed by the pub’s own micro brewery. They offer third pint sampling trays for you to try and work out which is your favourite. The surroundings are idyllic, the pub is gorgeous. A lovely interlude.